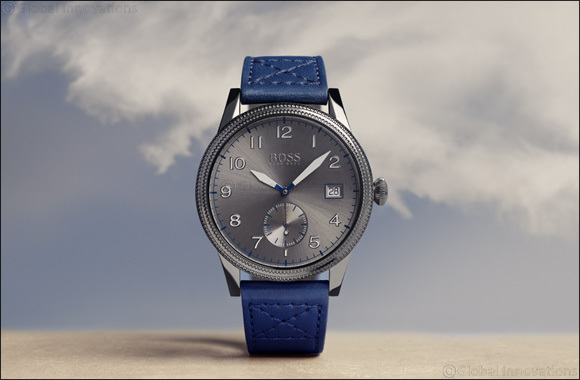 Dubai, United Arab Emirates - April 11, 2019: The BOSS Legacy collection effortlessly combines classic vintage style with a more refined contemporary and sporty look, perfectly capturing the essence of modern masculinity in a selection of watches whose style is inspired by the classic pilot’s watch design. For the man who likes to make a bold and yet understated style statement with their timepiece, the typical large Arabic numerals not only lend the sunray dial a distinctive look, they also ensure that the watch can be read at a glance in those moments when time is quite literally of the essence. Continuing with the aviator theme, these elegantly sporty watches also incorporate a small-second subdial at 6 o’clock, a square date display window at 3 o’clock, striking sword hands, and a unique textured bezel. This is a timepiece perfectly suited to fashion-conscious highfliers with an appreciation for tradition, an eye for contemporary retro style, and a taste for adventure. With nine different combinations of case finishes, strap materials, stainless-steel bracelets, and dial colors, the collection also offers an option for every casual look. Whether in stainless steel with a matching bracelet and blue dial, gray ion-plated finish with a green fabric strap and parchemin dial, or coffee ion-plated finish with a brown strap made from high-end Italian calfskin leather and a green dial, this is a watch that is as multifaceted as the gentleman who is wearing it. This Hugo Boss timepiece is priced at AED 1095 and is available across Hour Choice stores in the UAE.